I’m not too familiar with Banjo-Kazooie despite hearing the name a whole lot. The problem is that most of the games never came out for a console that I’ve owned. This is the first installment that I get to play. The lead duo seem fun enough and I’m always up for more platformers. I may have joined this franchise late, but better late than never right? It’s a fun title and one that you won’t want to miss on for the GBA. You don’t have to worry about playing previous games to understand what is going on here. The plot starts with Gruntilda escaping her rocky grave to enact her revenge on Banjo and Kazooie. She succeeds in kidnapping Kazooie so now Banjo must do whatever he can to get his pal back. Fortunately his friends are around to give him useful tips and transformation techniques so he can succeed at this goal. Once the duo is together again, they vow to put an end to Gruntilda’s plans once and for all. Let the villains try to stop them, nobody can mess with their teamwork!! The plot is fairly direct as you’d expect. There are 6 worlds and each one has a certain amount of objects to obtain. Grab enough and you can head to the next world. You’ll need 50/60 of them in order to fight the final boss so you can effectively skip a world if you collected them all. I don’t think it is possible to skip the entire world since some orbs can’t be obtained until after you get some other power ups but you can skip a reasonable chunk of them. Each world is connected through a door so by the end of the game the hub world is quite huge. You’ll probably get lost a few times, but eventually you’ll get the hang of it and then it’ll all be cake for you. The levels use an overhead camera and you move as you would expect. You start the game only being able to jump and roll but by the end you can glide, use super jumps, and have an array of other abilities at your disposal. You better make sure your L and R buttons work well because if they’re damaged like mine then the latter levels could be a little tougher than you might expect. Always keep your guard up. None of the levels feel cheesy and there aren’t any bugs that I came across so the game is designed well. Graphically the game has aged quite well. The character models are on point and the level layouts are nice. There isn’t much to say about the soundtrack, but the themes aren’t bad. On a technical level the game succeeds. I also naturally have to mention that the sound effects used for whenever a character would talk are naturally a blast as well. It reminds me of Yooka Laylee which is likely a homage to this title. Everyone sounds like they’re gargling under water and over the top effects like that are always fun. The only area where the game does get a bit iffy with the replay value though. You’ll be able to easily 100% the game in under 10 hours. At that point there won’t be anything more to do. Still, it’s a fun play through and if anyone ever asks you what a platformer is you can redirect them to this game. It contains everything you would expect to be in a title of this genre. It’s a solid all around title. I also appreciate how Banjo and Kazzoie both have unique personalities. It feels like some platforming protagonists don’t have a whole lot to say or express during the game. These guys are not like that. Kazooie is the kind of guy who is constantly throwing insults around and he keeps everyone on edge. While getting kidnapped may prevent you from taking his tough talk seriously, it’s always good to have a character like that. Without him the villains would probably walk all over Banjo. In comparison, Banjo’s a very nice guy who is always doing his best. He stays polite through it all and I suppose that this is admirable although he isn’t nearly as much fun as Kazooie. Aside from the main platforming levels you also have a few minigames which are always fun. One of them is a fishing game where you have to reel in some fish. The timing of it can definitely get tricky and you’ll need to grab a lot of them but it’s a satisfying side mission to grab your attention. Then you also have the slides, there seems to be 1 per world. These are easy but also a nice detour as you try to grab a lot of energy pieces. I’d be game for more little side events like that. As for the villains, we have two of them in this title. The main villain is Gruntilda who is a witch with a lot of hype. She seems reasonably tough and I do like her confidence. She is a lot better than her sidekick who is a very smart King K Rool type foe, but one who doesn’t command her level of respect. I can see them returning for most if not all of the games in the series. Overall, Banjo-Kazooie is a fun game. I can see why the series was well liked in the past. The levels are well designed and the gameplay is pretty smooth. It has some unique gimmicks to complement the adventure and you’ll get to use all of your skills as the game goes on. It’s a little on the short side, but I imagine that the main games would have had a lot more content to wrap things up. If you get this game for a good price then it’s certainly worth it. I don’t think this series will be ready for the big hitters quite yet, but I look forward to a modern remake some day. 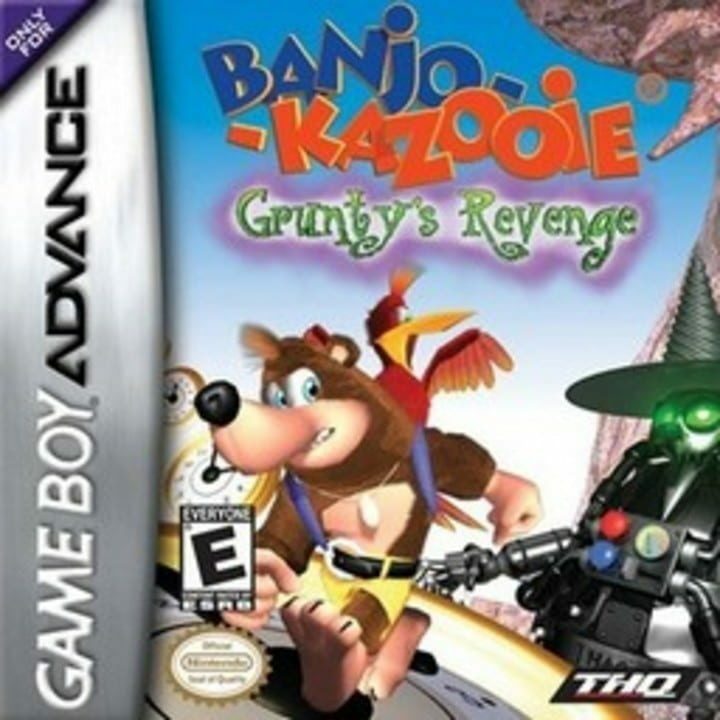 This entry was posted in 7 Star Games, Game Reviews, Games, Reviews and tagged Banjo-Kazooie, Game Boy Advance, Game Review, GBA, Grunty's Revenge, Nintendo, Platformer, Review, Video Game Review by dreager1. Bookmark the permalink.